The Beechcraft Baron is a light, twin-engined piston aircraft originally developed by Beech Aircraft Corporation and currently manufactured by the Beechcraft Division of Raytheon Aircraft (now Hawker Beechcraft). 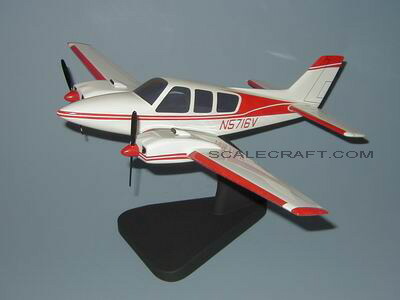 The Baron is a variant of the Beechcraft Bonanza, and was introduced in 1961. Mahogany wood. Wingspan 19 inches, Length 14 1/2 inches.